Hay Bro Sis...After unveiling the Monster 1200 R last week, Ducati continues to present its new 2016 vintage approach EICMA in Milan. The firm Borgo Panigale present developments in the Diavel Carbon for the coming year. This 2016 model will arrive in Ducati dealerships in late October. For 2016, the Ducati Diavel Carbon receives two specific silencer in brushed aluminum, new rims and a completely redesigned saddle. Arriving in dealerships in late October! In a few weeks now, it will open the EICMA in Milan. As usual, Ducati will unveil big news, but after the Monster 1200 R last week, it was the turn of the Diavel Carbon of a makeover. Pending a complete overhaul? 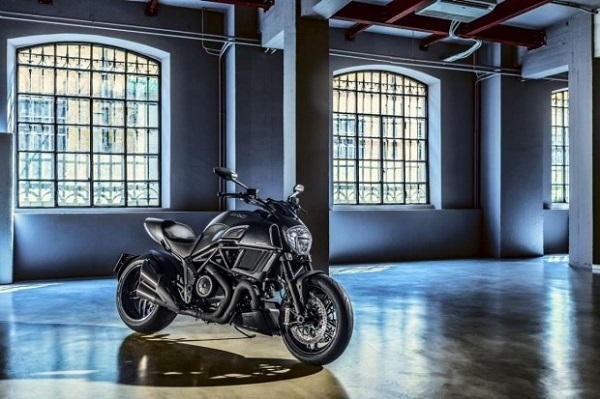 Thus, and for 2016 the Ducati Diavel Carbon will dress a new color called “Asphalt Grey” and will be equipped with new machined forged wheels, an exhaust system with treatment ceramic Zircotec look great, d a dual mufflers brushed aluminum, as well as a seat entirely redesigned. The technical characteristics do not change the Testastrette to 11 always develops its 162 horses in a free world and its weight is 205 kilos. Regarding the standard equipment, ABS brakes, traction control and different driving modes equip this version of the Diavel Carbon. Its arrival expected a price announced at € 22,290. Technically, the big Italian roadster retains its twin Testastretta 11 ° Dual Spark delivering up to 162 horsepower free version. The series of technological equipment includes ABS braking system, a traction control DTC and several driving modes. Carbon release stands out from other models in the range covered by the reservoir, its hull saddle and front fender all made of carbon fiber. This bike still retains its inverted 50mm fork, its instrumentation and its TFT LED lighting. For 2016, the changes are aesthetic. The Diavel is adorned as a new color “gray asphalt”, red piping on the seat shell, tank and fender and a frame painted “Dark Chrome”. The wheels were also changed since found new forged wheels. The exhaust has meanwhile a ceramic treatment Zircotec to the pipes and terminates in a dual mufflers duplicate brushed aluminum. Finally, the seat has been completely redesigned and features a new trim.